An agent who recruited overseas students for universities across Wales pocketed more than £300,000 in commission fees he was not entitled to, a court heard. Kevin Davies, 42, diverted the fees into bogus bank accounts and then into his own account after getting into financial difficulties. 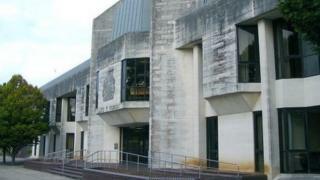 Davies, of Kenfig Hill, Bridgend, admitted fraud at Swansea Crown Court. A judge jailed him for three years and four months. Paul Hobson, prosecuting, said Davies had been a business services analyst for Navitas Holdings UK, which ran one-year foundation courses for foreign students hoping to join UK universities. Commission fees were payable to agencies that recruited the students and more fees were payable by the universities they later enrolled in. The court was told Davies set up bank accounts linked to four agencies that were now dormant. Mr Hobson said no fees were payable for students who had approached Navitas directly but Davies, through his position in the company, had access to the identities of all students. In 2013, Davies began claiming commission payments on behalf of students who had joined directly. The fraud began to unravel when Davies "made his mistake" and directed a genuine commission payment directly into his own personal bank account. The agency queried why it had not been paid and one of Davies' colleagues began looking into it. They discovered Davies had been deleting computer records. The data was recovered and his colleagues identified £282,000 worth of commissions that should not have been paid. Davies, who had been on leave, returned to find he had been suspended and his bank account frozen. He was allowed into his office to gather personal belongings but began to delete computer files. They were also recovered. Mr Hobson said Navitas had reimbursed the universities for commission fees they should not have paid. He added that civil action resulted in a High Court order forcing the sale of Davies' home. Dan Heard, defending, said Davies and his wife had bought a plot of land and began building a home, but the costs had spiralled. Davies, said Mr Heard, was now divorced and bankrupt. Judge Paul Thomas said he was concerned to hear that after losing his employment at Navitas Davies had gained a job involving finances with the Welsh Rugby Union presumably, he added, without telling the WRU he was due in court for fraud. Judge Thomas said Davies had been systematic and deliberate and had damaged the reputation of his former employer so much so that its crime insurance premiums had gone up.